What makes over 200 whales die in strandings over several days? As many as 145 pilot whales have died after a mass stranding in Mason Bay on Stewart Island. A hiker reportedly spotted the whales on Saturday and notified Department of Conservation staff at 10.30pm. There were two pods stranded at the southern end of Mason Bay, approximately 2km apart. 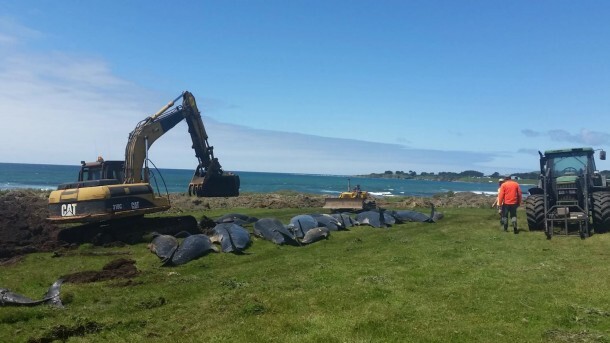 DoC Rakiura operations manager Ren Leppens said half of the whales had already died by the time they were found and due to the condition of the remaining whales and the remote, difficult to access location, the decision was made to euthanise the remainder. "Sadly, the likelihood of being able to successfully refloat the remaining whales was extremely low. The remote location, lack of nearby personnel and the whales' deteriorating condition meant the most humane thing to do was to euthanise." "However, it's always a heart-breaking decision to make." On Sunday 10 pygmy killer whales stranded at Ninety Mile Beach. Two have since died and attempts were being made to refloat the others. It was the second stranding in the Far North in three days after a 15m sperm whale died on Tokeroa Beach on Saturday, after washing ashore on Friday. 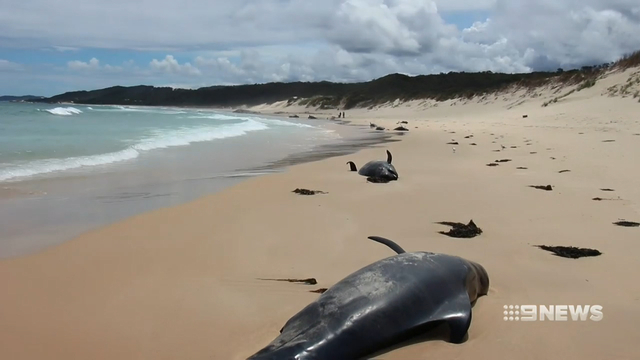 Fifty pilot whales have been found dead after a mass stranding in the Chatham Islands. Initially, up to 80 whales were found beached at the southern end of Hanson Bay near Owenga township yesterday evening, but it was too late in the day to help the animals, the Department of Conservation said today. When staff showed up at the beach this morning, they were relieved to find that about 30 or 40 of the whales had re-floated themselves without human intervention. However, another 51 whales remained - all of them dead except for one. The remaining whale was euthanised by DOC staff. "It was the most humane thing to do," said DOC Chatham Islands Operations Manager Dave Carlton. "This is always an awful decision to have to make." The stranding comes only days after 145 pilot whales died on the shore of Stewart Island on Monday..
And eight pygmy whales beached themselves on Ninety Mile Beach in Northland last Sunday. Wildlife authorities have said it’s unclear what caused twenty-eight whales to become stranded at a remote beach in Far East Gippsland. The mass beaching at the Croajingolong National Park between Petrel Point and Rame Head was first spotted by aircraft pilot Grant Shorland senior yesterday about 4pm. Three wildlife experts that were flown in by helicopter found one dead humpback whale and 23 dead pilot whales. Four of the pilot whales were earlier in a critical condition, but died this afternoon; two were euthanised, while the remaining two died of natural causes. Pilot Grant Shorland said he was shocked and saddened by the mass stranding, which is the state’s worst in more than 30 years. The cause of the beaching remains unclear, but marine mammal expert Dr Kate Charlton-Robb said seismic activity of illness may have been a factor. Incident Controller with the Department of Environment, Land, Water and Planning (DELWP), Michael Turner, earlier told 9News.com.au this morning he’d never seen a beaching of this scale in 32 years with the department. “The whales are in a very remote part of the national park that’s only really accessible on foot,” Mr Turne said. "I recently responded to a beaching in Point Hicks, but that was only one whale. “We encourage people to steer clear of the area for safety reasons and to ensure the efforts of crews are not impacted,” he said. Sharks may be more active in the area. Wildlife officers will remain in the area over the coming days, and will take samples for research to better understand why they beached themselves and how it can be prevented in the future. The mass beaching comes just days after two massive pods of up to 145 pilot whales washed ashore on a beach in southern New Zealand. Many died before help arrived, while the rest were euthanised by conservation workers. 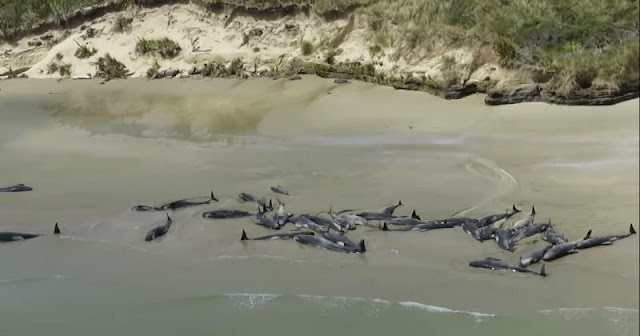 New Zealand's Department of Conservation has released heartbreaking footage showing dozens of pilot whales sprawled helplessly in Mason Bay on the west coast of Stewart Island. There is so much happening that I am happy to bring you this from Rick Davis (aka. Ricefarmer) who has been putting together these lists of stories related to collapse for longer than I’ve been at this. Putin: "We Aren't Aiming To Ditch The Dollar, The Dollar Is Ditching Us"
If The Saudi's Oil No Longer Matters Why Is Trump Still Supporting Them? People in Germany and the United States appear to have very different ideas about the state of relations between their countries. Germans see Berlin and Washington increasingly at odds, but Americans are more positive. Europe’s diesel market, already reeling from weeks of low water levels on the Rhine River, is now contending with a major supply disruption in France. In summary, Spain can’t transition to 100% renewable electricity without some economic means of storing its surplus wind and solar for re-use. Currently there is no technology other than pumped hydro capable of doing this, and Spain’s conventional and pumped hydro potential is nowhere near large enough to bridge the gap. The protesters from across Maharashtra, who are struggling to cope with the drought, are demanding the proper implementation of the loan waiver package announced by Fadnavis in 2017. To be fully human, we need to put down our phones for a while. The West is complaining about Russian 'aggression' but the incident looks more like a cheap ploy by a desperate Ukrainian president and US conservatives keen to undermine Trump's next pow-wow with Putin. Assange never met Manafort. The DNC emails were downloaded by an insider. Assange never even considered fleeing to Russia. Those are the facts, and I am in a position to give you a personal assurance of them. I can also assure you that Luke Harding, the Guardian, Washington Post and New York Times have been publishing a stream of deliberate lies, in collusion with the security services. Forensicator recently published a report titled Guccifer 2’s Russian Breadcrumbs, digging out many new metadata clues found in the documents that Guccifer 2.0 modified before publishing them on their WordPress blog. That report builds on Forensicator’s previous work, which detailed the complex process that Guccifer 2.0 likely used to plant “Russian fingerprints” in the Trump opposition report that Guccifer 2.0 pre-disclosed to two legacy media outlets and later published. Russia ‘invaded’ Crimea? Russia ‘downed’ MH17? Russia sent two hapless and inept blokes to kill the Skripals? Russia launched an unprovoked attack on three Ukrainian vessels in the Sea of Azov? Russia colluded with the Trump campaign against Hillary Clinton? And collaborated with Julian Assange to make that happen? What all these allegations have in common is that there is no evidence any of them are true. Oh, and that nobody’s really trying to prove them anymore. Because you’ve already accepted them as gospel.